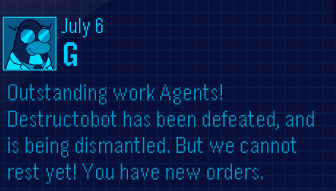 Cold Dude Computers: EPF Message From Gary! It says: "Outstanding work Agents! Destructobot has been defeated, and is being dismantled. But we cannot rest yet! You have new orders." The new orders he is talking about is the Field Op, to complete it click here. Where do you think Protobot is? Leave a comment and let us know!